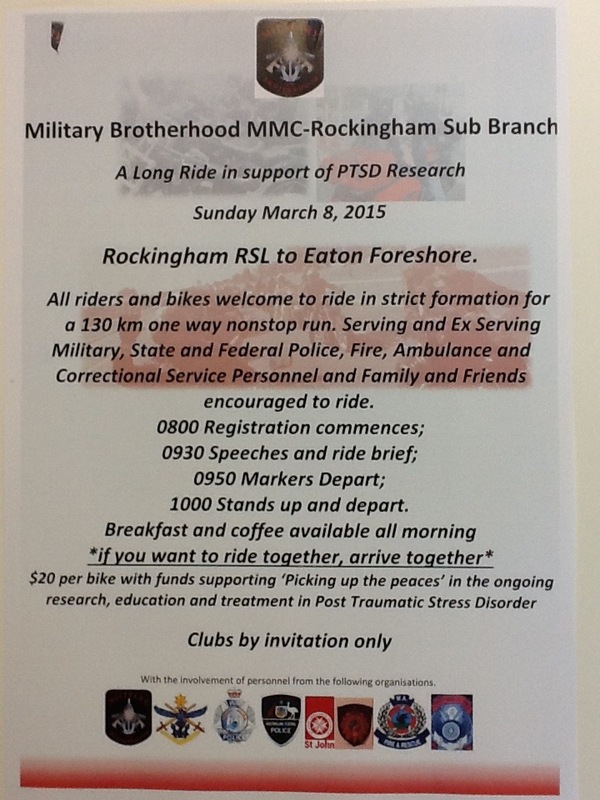 A huge Thank you to the Military Brotherhood MMC – Rockingham Sub Branch -Proceeds going to Picking Up The Peaces! Carolyn Bradley and the isolated Bibbulum Track – A long walk for Post Traumatic Stress Disorder. After weeks of rain, mud, sleepless nights, isolation, being lost and walking on her own, Carolyn Bradley is just about to walk into Albany having trekked nearly 1000 kilometres down the Bibbulum Track… and mostly on her own. I guess the fear she may have experienced, the loneliness and isolation is not unlike the experience of those who have PTSD go through on a daily basis. 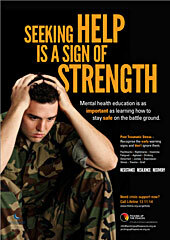 Sadly, PTSD and its associated health difficulties are overlooked or even denied within our uniformed services. There is a stigma that makes those personnel believe that they are seen as weak or soft… and that their career is seriously jeopardized if they do acknowledge they are struggling and seek treatment… Many personnel are suffering in silence… Many families are crumbling under the strain. It is evident now that many emergency service personnel are most likely to experience overwhelming trauma due to the nature of their work. 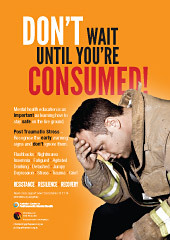 Police, Fire & Rescue, Rural Fire Services, Paramedics and Nurses, among many other professions are exposed to multiple distressing traumatic events which in-turn can lead to nightmares, night terrors, flashbacks, loss of the capacity to feel safe in many situations, a reluctance to engage in activities they once enjoyed – social isolation, substance abuse, relationship difficulties, memory loss, concentration difficulties, hypervigilance and bouts of anger… and sadly even suicide. – It’s been said that uniformed services personnel are 3-4 times more likely to experience psychological injury through the nature of their work than our general community. Some recent alarming statistics have indicated that that for every Police Officer killed in the line of duty, 5 have taken their own life. “We need to raise awareness and address the stigma attached to personnel coming forward and being identified as having a trauma response” says Katie Tonacia, Founder and CEO of Picking Up The Peaces. Caroline and Marianne chose to support Picking Up The Peaces, when they decided to go on this amazing trek. Picking Up the Peaces is an organisation established to support, educate, and raise National awareness about PTSD and its associated health difficulties for our uniformed services personnel, including military. There is a strong culture and social identity that comes with donning a uniform… It is a truth that must be acknowledged that these brave men and women usually run straight into danger when the rest of us are running in the opposite direction. Carolyn and Marianne took off on this adventure on the 2nd of September. Many blisters later and with a fierce sense of pride, Carolyn will hike into Albany on the 29th October. She can be lauded for completing the mission she set off to accomplish, ie. Trek the Bibbulum Track and raise awareness of Post-Traumatic Stress Disorder. The irony is that the completion of her Trek coincides with the 100 year anniversary since the first convoy set sail from Albany carrying Australian and New Zealand troops to the First World War. A very fitting end to Carolyn’s amazing feat! War neurosis, battle fatigue, war stress, soldier’s heart … these are just some of the names given over the decades to what we now know as a diagnosable medical condition known as PTSD. Throughout history this condition has affected a great many of our troops and their families and will continue to do so if we don’t raise awareness about the signs and symptoms so that those afflicted and their families can seek help without being judged as weak or unmentionable, and receive the treatment and support that they deserve. Carolyn is a “Military Mum” and health nurse whose partner lives daily with the long term psychological, physical and social effect of PTSD. Tony, an ex SADF (South African Defence Force) veteran of the late 70’s and 80’s, also spent time over the past 30 years in Central Africa, Eastern Europe, the Middle East and more recently Afghanistan with the Coalition Forces. He is an ardent supporter of both Carolyn and Marianne while they undertake their 1000 km walk. Marianne, “Maz” has over the years, worked with Australian military veterans and has experienced first-hand how PTSD affects not just the patients, but also the whole family and their close friends. Both Carolyn and Maz are dedicated to making a difference and looking for ways of unlocking the stigma that the label “mental illness” has in the community. Sadly and unfortunately “Maz” had to leave the track, because of a severe medical condition after having completed a very rough portion of the early stages of the Track. Carolyn persisted on her own!! Along the route, Carolyn, has met some very interesting people and noticed that in every town she enters the people come out and give her “high fives”. “It is as if they know who you are and what you are doing and give encouragement all the way”. Tony has been in regular brief contact with Carolyn and she reports that there has been some frightening moments too. She told about getting lost due to signposts being burnt in bush fires, about rats and bandicoots raiding the huts and stealing food from her pack, and on one occasion being chased by an emu. “There are other times when the scenery takes your breath-away,” Carolyn said, “with its beauty of early morning mist in the valleys and rivers and creeks that can’t be described.” The Bib’ Track is a must for anyone with a strong character and a passion for the West Australian Outback. 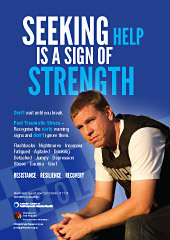 Both Carolyn and Maz strongly encourage sufferers of PTSD to “seek help and not to think they are alone!”. On behalf of the team at Picking Up The Peaces we would like to congratulate Carolyn and Maz for their efforts in assisting us to raise awareness of this debilitating and serious condition. PTSD is the MOST prevalent mental health concern affecting our Australian population, including within our uniformed service personnel. Picking Up The Peaces is a not-for-profit registered organisation committed to a national PTSD awareness campaign. We provide education programs, support and assistance to those who serve their country and community and who have at times paid the ultimate price for doing so. If you would like to donate and show your support for Carolyn and Maz please contact the friendly staff at Picking Up The Peaces. 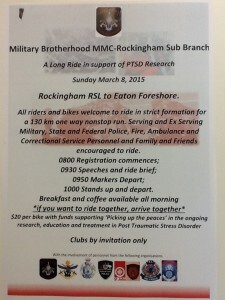 Stomp out the stigma of PTSD! !